Nov. 13, 2017 10:00 a.m. The B.C. NDP-Green government is pressing ahead with its plan to change the voting system in time for the next provincial election, and is facing bitter opposition from the B.C. Liberals. MLAs have been debating two major changes, one to replace corporate and union donations with a public subsidy based on previous votes, and another to adopt a still-undefined system of proportional representation. The system is to be defined by the government and put to a referendum to be held by the fall of 2018. Unlike the past two province-wide votes on the issue, this referendum is to be decided by a simple majority of all participating voters, without requiring support from a majority of constituencies. Without regional support, the referendum will likely be decided by the southwest corner of the province, where three quarters of the population resides. Metro Vancouver alone is home to more than half of B.C.’s 4.6 million people. Debate has been harshly divided. Prince George-Mackenzie MLA Mike Morris is among the opposition members accusing the NDP and Greens of a “backroom deal” to remake the voting and party financing system to favour themselves. 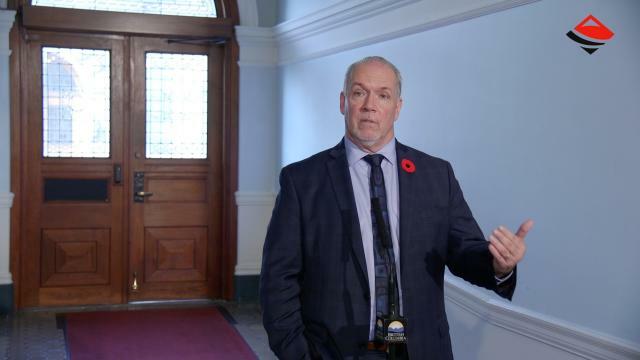 Premier John Horgan has promised that rural representation will be protected in a new system, but that too has yet to be defined. B.C. already has a law that requires regular judicial review of the distribution of MLA seats. In the last two reviews, the former government required that rural and northern seats not be merged or eliminated due to low population. Stikine, home of Forests Minister Doug Donaldson, is a vast northwest region with a population of fewer than 21,000 people, 60 per cent fewer than the average of B.C.’s 87 constituencies. Surrey-Fleetwood has a population of more than 60,000, after new seats were added to Surrey and Richmond for the 2017 election to reflect their growth. “We have deviations in our seat sizes in terms of population that are completely out of whack with other jurisdictions in Canada,” Horgan told Black Press. “So I’m not surprised that there is concern that we take every step to preserve rural representation. It’s fundamental to British Columbians, and I’m committed to make sure that happens.